The Only Point Based Race Creation System for OGL! GMs with a taste for world-building can either borrow races for their setting from other sources, or build new races from scratch. Presented in this sourcebook are guidelines for designing new character races with access to a wide variety of abilities and balancing drawbacks. Whether these are exotic new races or variants of more familiar fantasy races, the tools are in your hands. This sourcebook contains everything you need to create variations on your favourite races to all new, all different racial ideas that no one has seen before. If you like creating new races for OGL gaming but wished there were rules that actually made sense, your prayers have been answered. 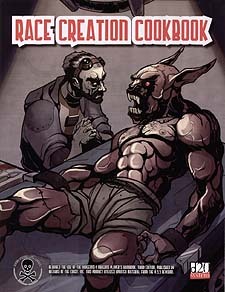 The Race Creation Cookbook is the book you have wanted to see done in an easy way to add to your game.